The hotel industry is subdivision of the hospitality industry specializing in accommodation. Often, it's the case that hotels also offer almost every sector of related goods and services in the hospitality industry along with other amenities. This can include lodging, food & drink and wellness. Major players in the industry include Wyndham Hotel Group, Marriot International and Hilton Worldwide, with 8976, 6,542 and 5,405 properties, respectively, across the world. Important performance indicators for the hotel industry include market size, company revenue and brand value. The market size of the global hotel industry was just over 570 billion U.S. dollars in 2017. 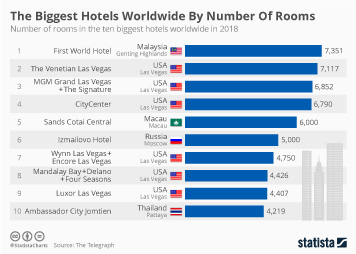 The hotel company contributing the highest sum to the market size was Marriot International, accounting for a total of 22.3 billion U.S. dollars in revenue. Hilton Worldwide came second to its competitor with a sum of less than half of Marriot's total revenue. However, Hilton Hotels & Resorts recorded the highest hotel brand value in 2018 - valuing at 6.33 billion U.S. dollars. Other useful performance measures for the hotel industry are the average daily rate (ADR), revenue per available room (RevPAR), and occupancy rates. The Asia Pacific region recorded the highest occupancy rate in the world at 72.8 percent. That being said, the highest global average daily rate and revenue per available room were recorded in the Middle East and Africa. More interesting topics from the industry "Hotels"